Easter Sunrise in the beautiful red rocks of Colorado provides a spectacular view. 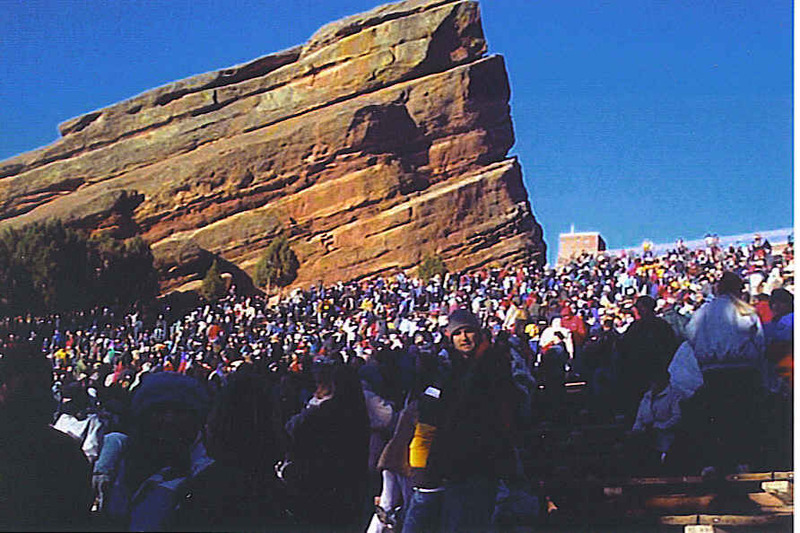 Imagine watching the sun rise over the mile high city of Denver, Colorado in the Red Rock Amphitheater, formerly known as the Garden of Angels. Mother Nature displays her beautiful handiwork every direction the eyes turn. 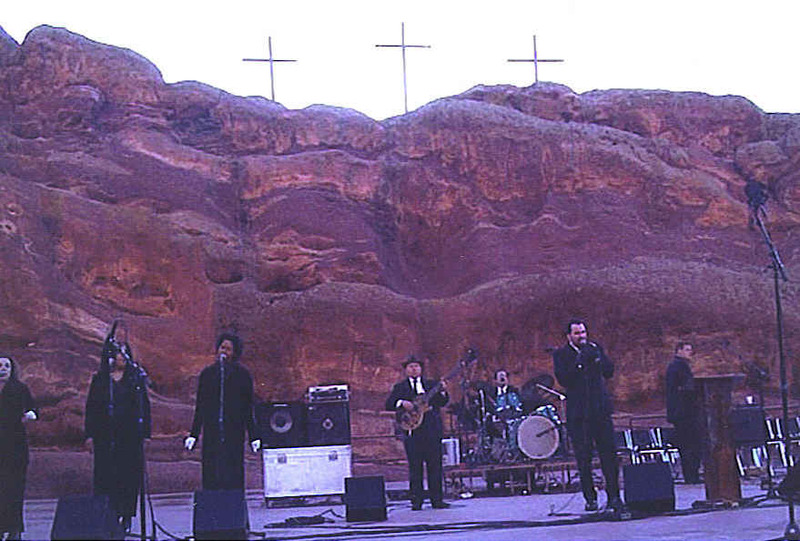 Nestled in the Rocky Mountains, The Red Rock Amphitheater, only fifteen miles west of Denver, sets a magical stage for Easter Sunrise as well as many concerts throughout the year. Great acts including John Denver, the Beatles, Sting, U-2, the opera, and many symphony orchestras vie to perform in this magnificent setting. This geological phenomenon, at an elevation of 6,450 feet, happens to be the only naturally occurring, acoustically perfect amphitheater in the world. 250,000,000 years ago, the shifting movement of the earth’s plates pushed up two large rocks. Today these two, extending 300′ above the amphitheater stage, are called Ship Rock and Creation Rock. They form the natural amphitheater shape with perfect acoustics. Those surroundings naturally attracted performing artists to a roughly built stage as early as 1906, but most likely the Ute Indians used this setting for ceremonies long before that time. 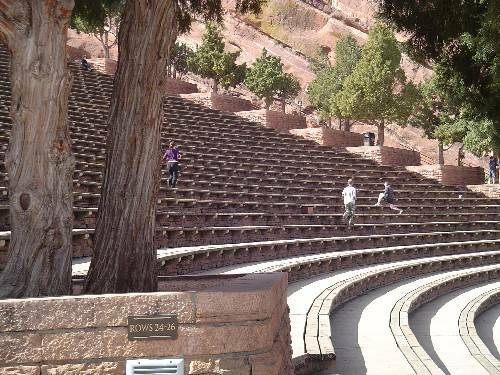 The amphitheater steps and seats were built by hand during the great depression. The Civilian Conservation Corp completed work in 1935. It was dedicated in 1941 with the first service in the newly constructed setting being an Easter Sunrise Service. In order to get a good seat and a close parking place for Easter Sunrise Service, arrive at Red Rock Amphitheater by 4:00 in the morning. Otherwise, you could have quite a long walk up the mountainside. Seating might not be a problem since it can easily hold 9,000 people. On many occasions however, it is filled to capacity. Easter Sunrise is always the first performance of the season. In a recent trip, Reverend Leon’s Revival began the early morning service by reciting and singing one of his favorites, Refrigerator Call. Rev James Ryan, Executive Director of the Colorado Council of Churches, has conducted the service since 1999. The service culminated with an Indian in full dress playing a melodic flute solo. Release of a hundred doves took place just as the sun rose on the horizon. Three crosses atop Stage Rock made a spectacular backdrop for sunrise. Listening to nearly nine thousand people lift their voices in the song, He Lives, was an amazing experience never to be forgotten. 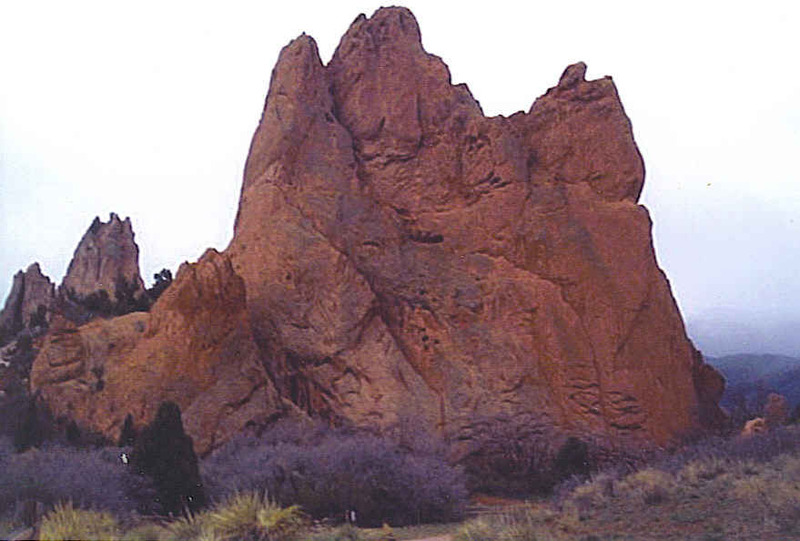 While in the area, travel just a little south of the Red Rock Amphitheater to Colorado Springs. There you can stroll through the geological masterpiece, Garden of the Gods, which provides a place of inspiration and relaxation. Take time to wander among the great red giants. Around every bend of the path, unusual red rock shapes loom skyward. Upon closer observation, petroglyphs left by the ancient Ute Indians, who used this as a tribal meeting ground, add a bit of intrigue. This is definitely Red Rock Country! Red Rocks Amphitheater is located in Red Rocks Park near Morrison, Colorado, 15 miles west of Denver. Coming from Downtown Denver, take I-70 west to exit 259, turn left at the bottom of the Morrison exit ramp, cruise on downhill 1.5 miles to the Red Rocks Park entrance. Coming from south Denver, take C-470 to the Morrison exit, turn west and follow the signs to the Park entrances. This sounds marvelous. The only sunrise service I’ve been to is at Flag Pole Hill in Dallas. A lovely service, but nothing to compare with this! Red Rock Amphitheater is quite spectacular. The sunrise atmosphere with so many singing praises was quite inspiring. Thanks for stopping by Gypsy Road Trip. It looks very impressive. I get the feeling of what it must be like in assembly, looking at your beautiful pictures. Outdoor services are very appealing to me where nature surrounds and enhances the spiritual feeling. The red rock areas of our Western US have a strong draw for me. Thanks for stopping by for another Gypsy Road Trip.